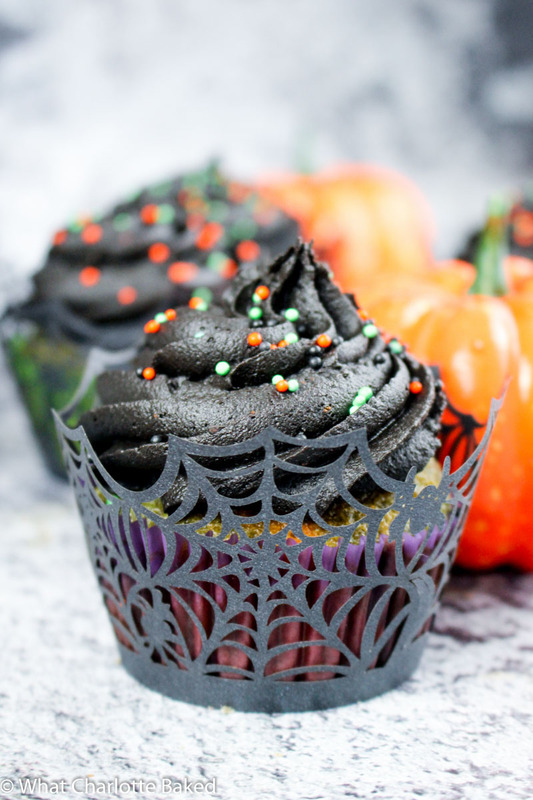 As soon as I started brainstorming Halloween recipes for the blog this year, my mind immediately jumped to black frosting. Ironic really, considering that the most popular post on What Charlotte Baked is How to Make Super White Buttercream. Give the people what they want and all that. But I was determined to get my butterscream as black as a witch’s cat. I’m sure you’ll agree that there’s something a bit creepy about an (almost) jet black swirl of buttercream on a cupcake. Take a look. 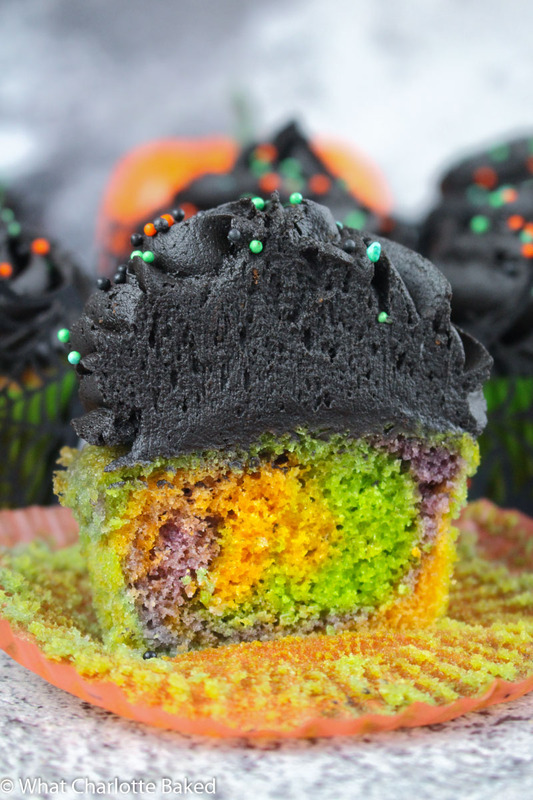 Because all that black frosting was just asking to hide a super colourful secret beneath it, right? So let’s talk about that super special black frosting in a bit more detail shall we? You’re going to start by making my easy chocolate buttercream, which is made with cocoa powder to avoid all that messy chocolate melting. It’s some seriously good stuff, and is always my first choice when whipping up the very best chocolate cupcakes. The fact that the buttercream is chocolate flavour really helps when turning it black, as the brown buttercream is much easier to colour than it’s cream counterpart. Plus, tasty as hell. I’m going to caveat this with a couple of points. I’m not entirely convinced that eating even food grade activated charcoal on a daily basis is necessarily good for you, but it doesn’t appear to be bad for you either. The jury’s still out. I do know that it’s used to treat drug overdose patients in hospital, as it essentially absorbs chemicals or drugs in your body before they can get into your system. So please don’t eat too much of it if you’re on prescription medication (like I am). So yes, even though I may have spent hours diagnosing myself with various ridiculous illnesses thanks to good old google, but I am 100% not a doctor. But, I’m fairly certain that a couple of tablespoons of the stuff in a batch of buttercream on Halloween isn’t going to kill you. The cupcake batter itself is pretty standard if you’ve been around here before. Variations of this stuff has made up my Eton Mess Cupcakes, Pimm’s Cupcakes, and even Butterbeer Cupcakes. The not-so-secret ingredient that goes into making these cupcakes so soft and fluffy is yogurt. I like to switch up the yogurt depending on the flavour of the cupcakes I’m aiming for, so for these little ghouls I used some straight forward vanilla yogurt. Not too much, just enough to keep things moist and scrumptious. If you’re wondering why I use yogurt in cupcakes, but sour cream in layer cakes, it’s all to do with the type of crumb it gives you. It might be my imagination, but yogurt seems to give a lighter texture which is perfect for a little cupcake, whereas sour cream makes things a little more compact and strong, which is much more suited for a layer cake that needs to hold itself together. What are you up to for Halloween? I’m not too sure of our plans just yet – hopefully we can find our way over to the Halloween scare maze near Bath, but I’m keeping things a bit casual at the moment in case I wimp out! There will definitely be some pumpkin carving on the cards though, as soon as I work out what design to try this year. I’ve got another Halloween recipe on the way for you next week, and this one might be even better. It combines my biggest real world fear (spiders) and one of the scariest things a baker can face in the kitchen (rolling up a Swiss roll). Only time will tell if I will make it out alive. Wish me luck. 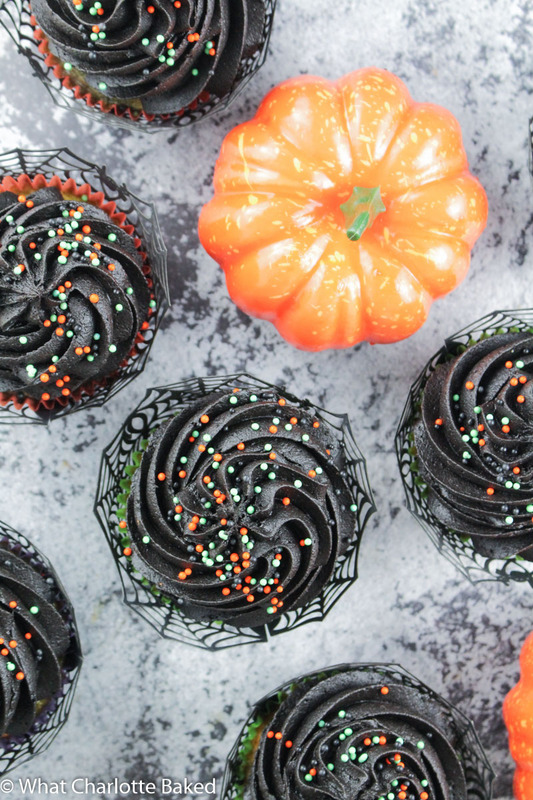 Don't be fooled, as hiding underneath a swirl of black chocolate 'butterscream', lies a vanilla cupcake marbled with all the colours of Halloween. Place the butter in the bowl of your stand mixer (or a medium sized bowl if using an electric hand mixer) and beat for a minute or so until light and creamy. Add the sugar and beat well for at least a minute, scraping down the sides if needed. Add the egg, vanilla, milk, and yogurt, and beat well until fully mixed together. Add the flour, cornflour, baking powder, bicarbonate of soda, and salt and fold together on a low speed until only just combined. Spoon about a third of the batter into three small bowls, and add a few drops of food colouring to each bowl, so that you have one green, one orange, and one purple. Mix each gently until the colour is even. You are looking for very vibrant colours, as they will fade a little in the oven, so add more food colouring than you think you need. Spoon or pipe the batter into the cupcake cases, alternating between blobs of each of the three colours. Make sure each of the cupcake cases is filled about 2/3 full - you can swirl the colours together a little with a skewer or toothpick if you like. Bake in the preheated oven for 15-20 minutes, until springy on top and a toothpick inserted into the middle of the cupcakes comes out clean, without any crumbs on. Place the tray on a wire rack to cool, and then after ten minutes, remove the cupcakes from the tray and leave on the wire rack to cool completely before icing. Beat the butter in a stand mixer, using the balloon whisk attachment, or if using a hand-held mixer then beat the butter in a medium sized bowl. Beat on high for at least five minutes, scraping down the sides with a spatula every minute or so. The butter should be light, fluffy, and very pale when it is whipped enough. Add the sifted icing sugar and cocoa powder in three or four stages, beating for at least a minute in between additions. Pour the milk into a small jug, along with the vanilla extract and one tablespoon of the charcoal. Mix together, and then pour into the frosting in two additions, beating well between each. If the icing is not black enough, add some more charcoal in ½ tablespoons, beating between each to check the colour. The frosting will never quite turn jet black, but you are aiming for something close. Pipe the buttercream on to the tops of the cooled cupcakes using a piping bag and a 1M icing tip. 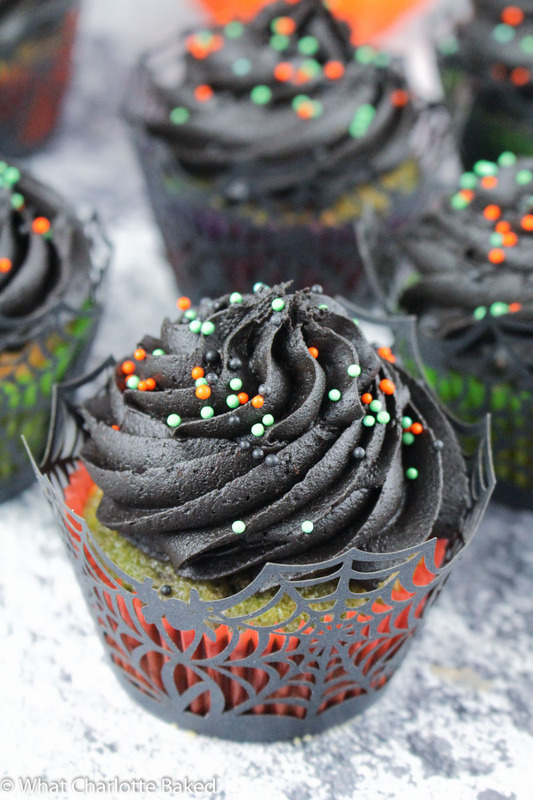 Add Halloween sprinkles and cute cupcake wrappers for a little extra spook-factor!